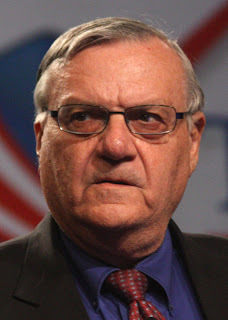 NCCPR Child Welfare Blog: Remember when Joe Arpaio’s men allegedly threatened to have a reporter’s children taken away? Remember when Joe Arpaio’s men allegedly threatened to have a reporter’s children taken away? Among the many unpardonable (or is that the wrong word?) things that allegedly happened during the reign of former Maricopa County, Arizona, Sheriff Joe Arpaio, let’s not forget the time two of his top deputies allegedly threatened to have a reporter’s children taken from her. ● In the 2011 post, I discussed a foster-care panic ending in Florida and continuing in Arizona. Now, Florida is panicking again and in Arizona, at long last, the foster-care panic may be ending. ● The post criticizes coverage of child welfare in the Arizona Republic. That coverage improved significantly over the past year, as a result of a new project led by reporter Bob Ortega. Unfortunately, Ortega recently left the Republic to join the investigative unit of CNN, to it is not clear whether the progress will continue. Child welfare in Arizona: They don’t threaten reporters, do they? Two top deputies in the Maricopa County Sheriff’s office allegedly threatened to retaliate against a reporter by taking away her child. That should give Arizona journalists second thoughts about their embrace of unchecked power to intervene in families – but it probably won't. It took Florida seven years to end the foster-care panic that swept through the state starting in 1999. But with Florida having reversed course and made children saferwhile significantly reducing entries into care, there now is a new record-holder for perennial foster care panic: Arizona. Although there are strong indications Napolitano herself realized within months that this was a huge mistake, she never said so publicly. Now, more than eight years later, Arizona still hasn’t sorted it out. Details are in our report on Arizona child welfare. The Arizona Foster-Care panic has broken Florida’s record. Nationwide, between 2002 and 2010 entries into foster care over the course of a year declined nearly 15 percent. In Arizona they soared 70 percent, with no end in sight. As always with foster-care panics, the one in Arizona backfired. All those false allegations and trivial cases and all that needless removal of children from their homes further overloaded caseworkers leaving them less time to find children in real danger. So the cycle of failure continues year after year. Every few years, when a new high-profile case or cases grabs headlines, everyone repeats the same mistakes – like assuming that the solution is to encourage everyone to report their slightest suspicions to CPS, further overloading the system. As a matter of fact, that’s happening right now. And sometimes it gets worse. Although politicians started the Arizona Foster Care Panic, a lot of the responsibility for keeping it going rests with the state’s press corps. The one reporter at a daily newspaper in the state who really came to understand child welfare, Karina Bland of the Arizona Republic, was transferred off the beat several years ago. So whenever there were signs the panic might abate, someone at the Republic in Phoenix and/or the Arizona Daily Star in Tucson would respond to a horror story by pouring on the hype and hysteria and start it up again. It’s not that these reporters didn’t hear from parents who said they were falsely accused or threatened with removal of their children for no good reason, perhaps as retaliation for being insufficiently cooperative with authorities. It’s just that, like many reporters across the country, the journalists at the big Arizona dailies rolled their eyes and figured it was probably just some lousy parent making up excuses. But one would think they’d reconsider after it happened to one of their own. Actually, it happened a couple of years ago, but only became public in May, and I just stumbled on it this week. It’s all explained in this story from the “Valley Fever” Blogon the website of the Phoenix alternative weekly New Times. A year [after the incident], after Arpaio had put Hendershott on administrative leave, Wingett complained to [sheriff’s office spokeswoman] Lisa Allen that he and Chagolla repeatedly had threatened to arrest her over the incident. "Next week, Yvonne, you're going to be arrested ... and your child is going to end up with Child Protective Services," they said, Wingett Sanchez told Allen, adding that she could barely speak about it without getting "emotional." The threats to Wingett Sanchez came in person and, at least once, by telephone, Allen reported. "She was always threatened that her child would end up in the hands of CPS, which was very upsetting to her," the report states. So maybe some of those parents some of those Arizona reporters have been rolling their eyes about aren’t so crazy after all. And maybe the kind of unchecked power law enforcement and child protective services have in the child welfare arena isn’t such a great idea after all. It’s not only reporters at the dailies who could learn from this story. If this little itemin the Valley Fever Blog itself is any indication, it seems that when the reporter who understood these issues best, Sarah Fenske, left New Times to become managing editor of Riverfront Times in St. Louis, the paper’s institutional memory concerning these issues left with her. In fact, it’s not just journalists who could learn from this story. I’ve often written about the hypocrisy of some of my fellow liberals - those on the left who forget everything they claim to believe in about civil liberties when someone whispers the words “child abuse” in their ears. (The response among many on the left to the FLDS case in Texas being a prime example.) But there’s plenty of hypocrisy among those on the right who say they’re against state interference in families and abuse of power by “big government” - but love people like Joe Arpaio.